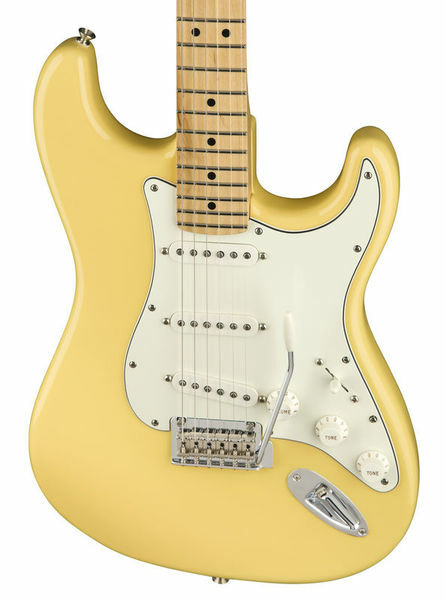 The Fender Player Stratocaster MN, Buttercream is designed for the aspiring guitarist. It features Fender's iconic tone and style coupled with modern performance in a budget friendly package. Its alder body produces a balanced tone, whilst the maple neck and fingerboard add plenty of brightness to suit a wide variety of playing styles and genres. 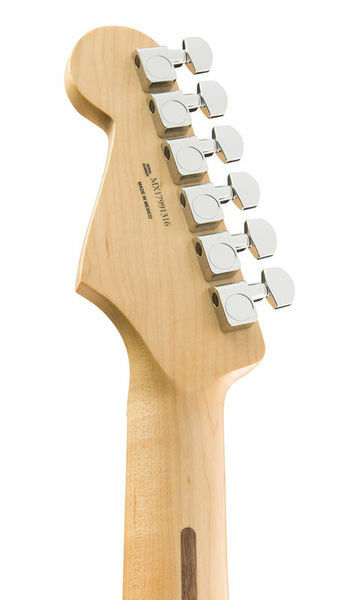 The neck has a modern ''C'' profile, designed to offer incredible comfort and a smooth playing experience. This Fender Player Strat is equipped with a set of versatile Player series single-coil pickups, while its synchronised tremolo offers stunning pitch shifting effects. Finished in Buttercream, the Fender Player Stratocaster is the perfect companion for aspiring guitarists seeking both tone and style. Featuring a classic alder body coupled with a maple neck and fingerboard, the Player Stratocaster offers an incredibly resonant, balanced tone with plenty of punch in the lower mids. The lightweight alder offers incredible comfort, while the smooth maple provides quick and easy position changes. The modern ‘’C’’ profile neck is designed for an incredibly comfortable playing experience, allowing the hand to fully cup the neck and slide smoothly. The Stratocaster is equipped with a range of high-quality components, delivering a professional performance for players on a budget. Its set of Player series single-coil pickups are infused with the soul of Fender, offering all the classic tones associated with popular guitar legends. A toggle switch, tone controls, and volume control provide excellent tone shaping capabilities, allowing players to dial in the perfect tone for their playing style. The 2-point synchronised tremolo provides players with stunning pitch shifting effects, while the addition of a synthetic bone nut helps enhance the natural resonance and string stability. When many people think of an electric guitar, this is the one that leaps to mind. The Stratocaster is one of the world's most popular guitars and is an elegantly versatile creation. Not long after Fender revolutionised music with the Telecaster and the Precision Bass, in 1954 they debuted the Stratocaster and it quickly became universally regarded as the archetypal electric guitar. Sleek and stylish aesthetics, smooth playing and tonally versatile. At its heart the Stratocaster remains a fantastic instrument, producing unmistakable sound with a timeless design. A first choice among players worldwide, there is simply nothing that sings, screams, whispers, moans, roars, rocks and rolls like a Fender Stratocaster.